During the early days of February, work has continued on site, despite the cold and wet weather. The Drying Room construction has continued and work has started on the Stamp Mill site. Drainage pipe being installed in the Stamp Mill trench. 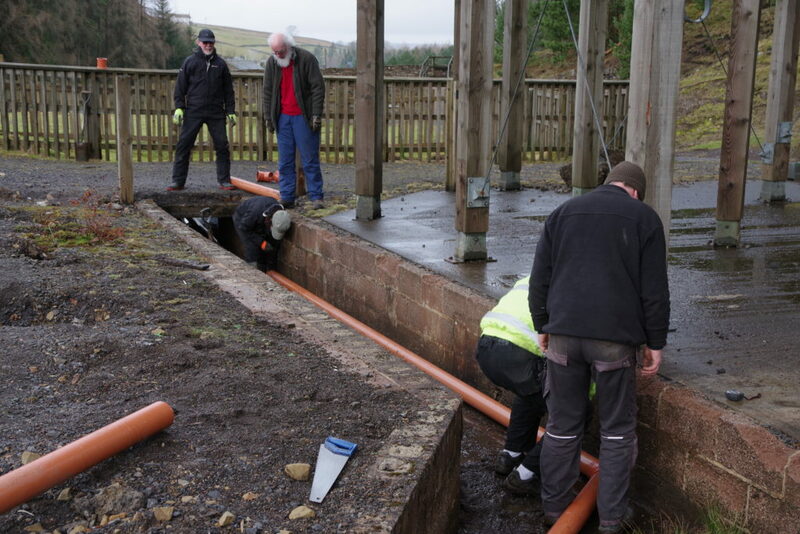 This pipe is laid as a contingency, just in case the site floods in future. We have given the site a new name to reflect the fact that the Power of Water structure will be demolished this year. 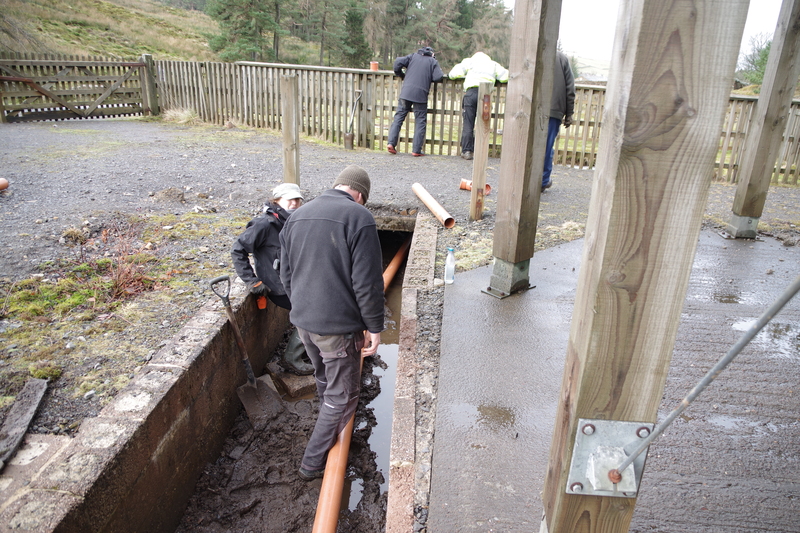 Colin arranging the outflow end of the pipe. 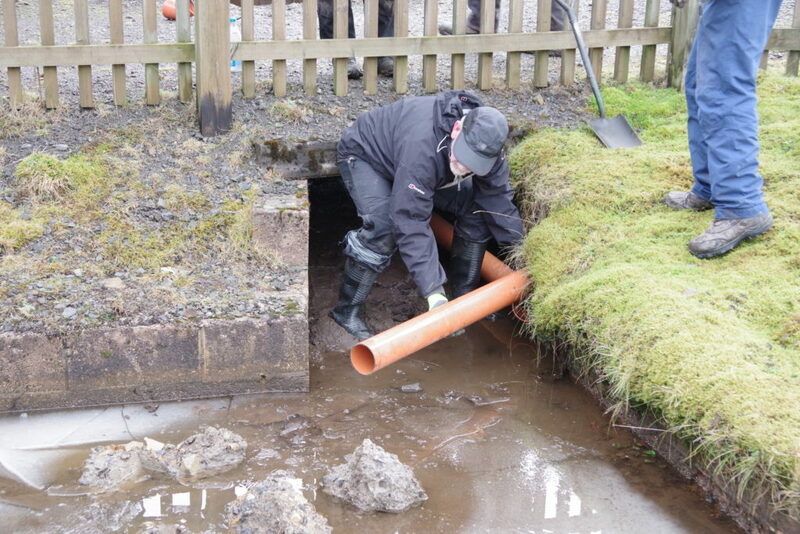 The pipe was later lengthened to bypass the pond, which will soon be filled with rubble. Allan demonstrating the use of a tape measure. 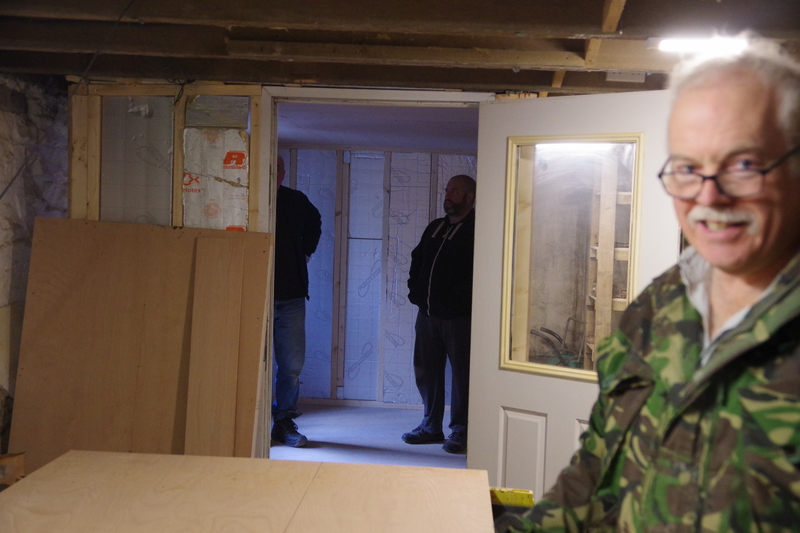 The Drying Room has wall panels of plywood, with an inner insulation layer. Author: John Barnatt. Photographs by Paul Deakin and others. Historic England, Swindon. 2019. ISBN 978-1-84802-381-9. 136 pages. 222mm x 275mm page size. Text, maps and many colour images. This book presents a detailed introduction to the underground mining and quarrying heritage in England. It reviews the many types of mineral and stone taken from the ground and looks at the archaeological remains that survive today and are accessible to those who go underground. 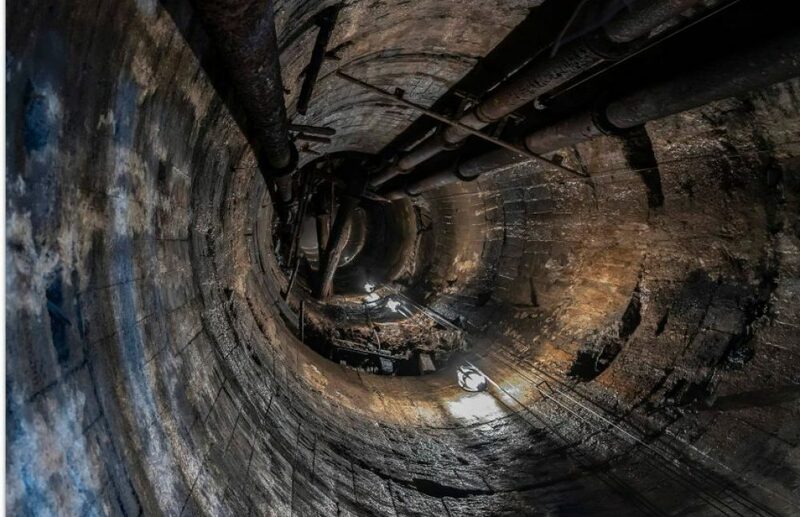 It is designed to illustrate the wonders to be found underground and give the reader ways forward should they wish to follow up their interest. 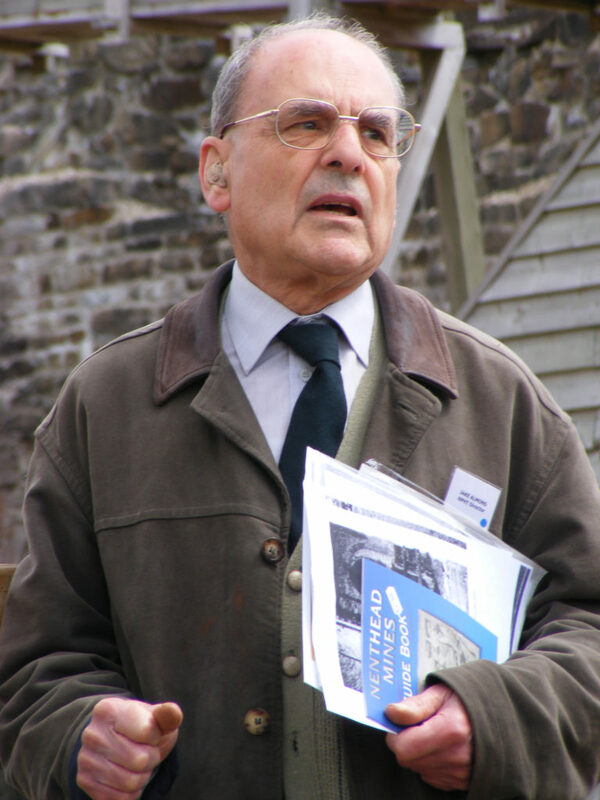 John Barnatt is an archaeologist with a long record of work on mining, particularly in Derbyshire. Part one of the book is an introduction to Mining and Quarrying and is followed by chapters on the products of mining and quarrying and the regional variations. Part two describes the common themes and the local diversity. John states that one primary aim of producing the book was “to inform people wanting to do their own archaeological investigations underground” and to provide a starting point for the inexperienced. Almost every page has coloured photographs and maps of underground features and the book is a visual pleasure for the reader. The photographs are very well chosen and provide an excellent visual summary of mines in England. There is a short section covering access and organisations that operate within England. Inevitably there are minor statements and captions that the reader might consider worthy of revision, but to fulfil the primary aim of informing people this book fulfils that aim. The book does not aim to be a gazetteer, nor is it an access guide, and it cannot cover all the details of history and technology that underpin the mining and underground quarrying industries. Apart from the sheer personal pleasure of browsing the pictures, I can see that this book will be an excellent tool to show a mine owning landowner, a local government planning department and to encourage experienced explorers to start recording the features that they walk past every weekend. It will also be a brilliant tool to encourage new people to getting involved in mining archaeology. Jake Almond – a memory. Dr J K Almond (Jake) died on 13th December 2018. 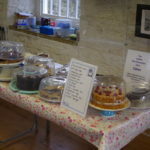 Jake was a Trustee of the North Pennines Heritage Trust, mineral processing engineer, writer about fluorspar and zinc mining, researcher and writer of the history of lead smelting, who cared about the heritage of UK mining. He was a long time contributor to the work of the Cleveland Industrial Archaeology Society, Historical Metallurgy Society, Association for Industrial Archaeology and the Open University. Art Installation at Nenthead Mines? Today we wrapped up the concrete compressor beds to give them winter frost protection. The concrete is being damaged by the winter frosts and this is an interim solution until were can design a better method. 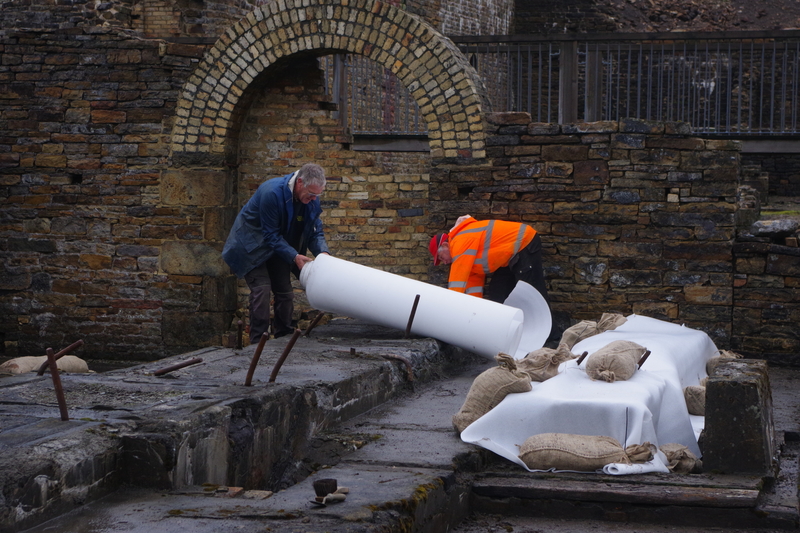 The sandbags were filled with gravel that has washed onto the site during heavy rainfall, so we are recycling waste materials into something more useful. Wednesday 17th October was a different day. We took detailed measurements of POW fencing because we are considering using the metal sections to replace the existing wood fence around the smelting mill. The measurements showed that the fence could be replaced from the Assay House corner to the gate just past the compressor concrete bases. The bent handrail at Carrs Mine exit was also measured in order to produce the replacement handrail. Nearby, the river bed waterfall plunge poll was cleared of boulders and the roadside culverts checked. Both had been affected by recent heavy rains. 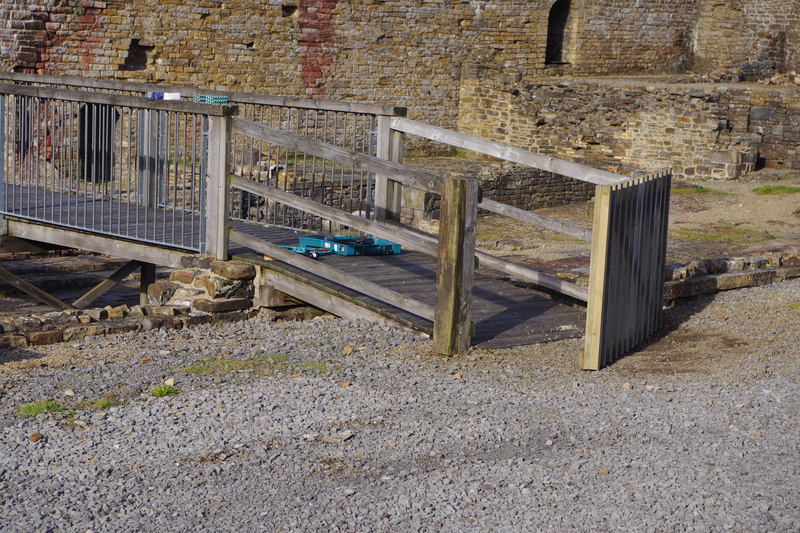 The redundant gate from P.O.W. was removed, modified and installed at the south end of the smelt mill footbridge – now possible to take visitors into south side of the mill site. The gatekeeper mine wagon was given another coat of yellow paint, and the switching arrangements for the Stagg condenser model were changed to make more them accessible. 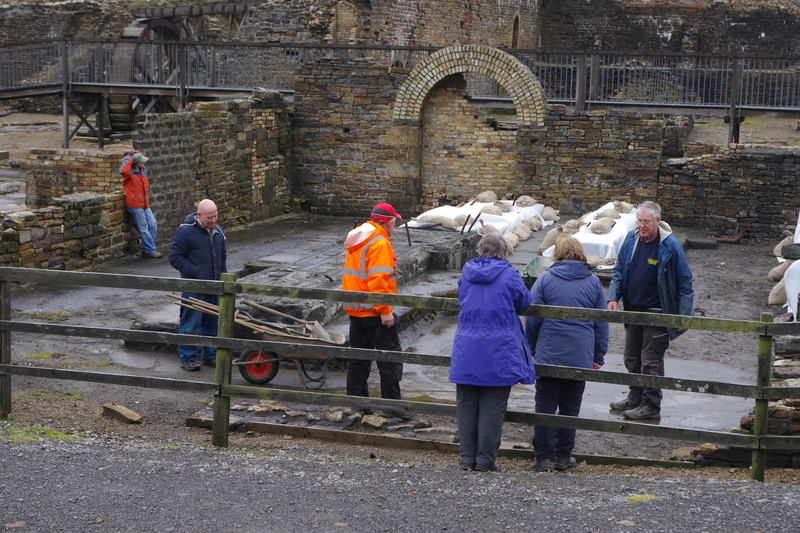 We also provided a Carrs Mine tour for six visitors, two of whom went on to have an afternoon Ballroom trip. The Allendale bargain book was also finally photocopied ( at Alston Library) so that the book could be transcribed in full. Slow progress continues here. Temporary steel supports in the roof fall are advancing. The recent heavy rains have shifted more of the shaft fill and filled up the excavated area. The next dig session will be on 21st October. Recent hot weather has slowed down our work programme, but we have achieved some objectives. Here is a summary from 27th June to 18th July. Conserving the EIMCO loader and a mine wagon: both items have been coated with rust preventing chemicals and the loader has been partly undercoated. Audrey has been responsible for most of this work. Rewiring the Barracks: the upstairs ring main and the boiler main have been installed and are working. Thanks to Colin for this task. Lighting the Display Cabinets: Andy and Anne have built custom led lights for most of the display cabinets, and have almost completed this task. Repairing the Dowgang footpath fence: ChrisB, Alec, Graham, Martyn and Rosemary have rehung the gate and started on fixing the fence across the burn. Erica, who lives nearby, has donated a length of mesh for the fence repair. Arch repairs in Carrs Mine: The floor level arch for the old lower adit has been walled by Jim. Stagg Wheelpit: Sheila has logged the vegetation within the safety fence, and has done a first draft of the SMC application for conservation work on the timbers. Building signs and Noticeboards: Repainted in a new shade of green, by Rachel, Nicola, Sheila and Joyce. Stray fridge; that had been dumped in Dowgang Hush recovered and recycled by ChrisB and Graham. Thompson’s Level: old shaft top fence repaired, level entrance cleared of vegetation, rails covered with ply, and the dump bund rebuilt. Leif, Allan, Greg, ChrisC, Nick, Rosemary and Joyce were all involved. ChrisC repaired the gate by welding. Archive: a start made with the Coldberry pay sheets by Margaret. Carrs Shop and Barracks Windows: have had some white paint recoated by Pete and Graham. 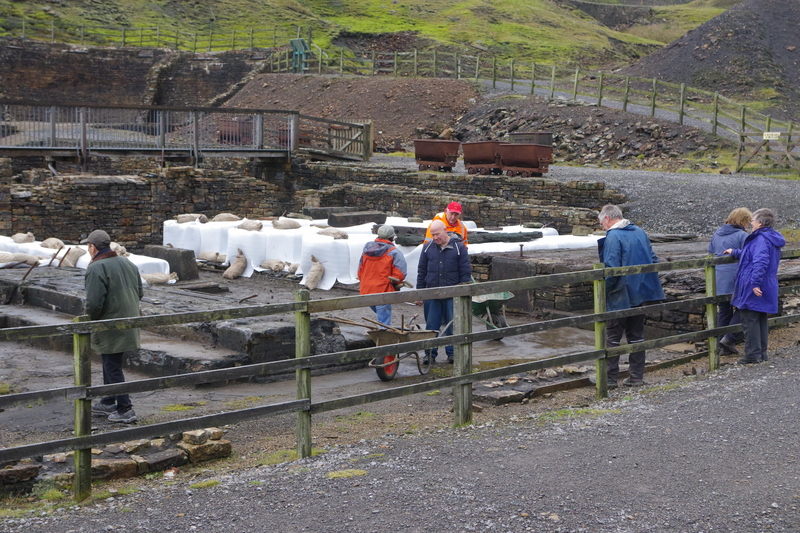 We have also had visits from the Nenthead Chapel team, and the pupils from Nenthead School. Since our last report, we have made slow progress on site. Snow has prevented access both to Nenthead and the site. An expected delivery of wood on 13th February was cancelled because the roads around Alston were impassable in places. The wood eventually arrived on the 16th. 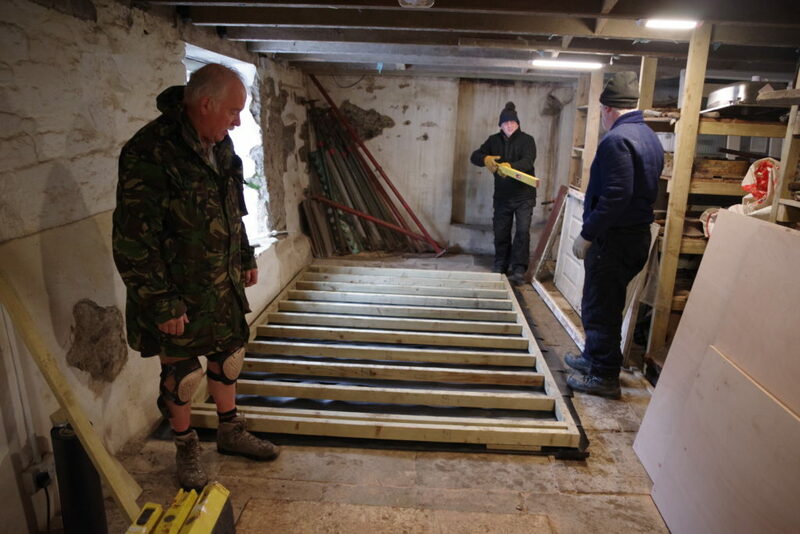 The wood delivery includes a joist and floor boarding for The Barracks. Work on the 10th and 11th had revealed wet and dry rot in a floor joist. 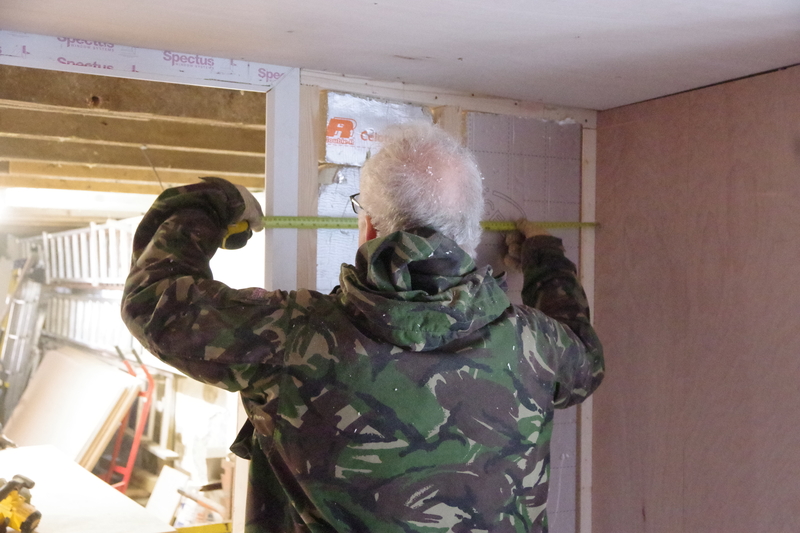 The affected timber was removed together with large areas of the ground floor ceiling and internal plasterboard walls. All this demolition created a mess of broken plasterboard and timber which was eventually stacked outside to await the arrival of a rubbish skip. Chris Chilton, Rachel Chilton, Will Barron, Sandra Hall, Pete Jackson,Allan Richardson, Steve Bentley, and Rosemary Vidler were the team. The skip arrived for Wednesday 21st but had to be left near to Rampgill Level because the skip wagon could not get traction on the icy road. Martyn Langley later dragged the skip onto the site using his Land Rover. On the 21st, the new joist was cut to size by Alec Langley and Chris Battersby and made ready for installation. Audrey Battersby cleared the ground floor mess and with Mark Hatton and Joyce Jackson worked to fill the skip with the demolition material. Colin Wilkinson was checking and rearranging the wiring in The Barracks. Sheila Barker and Anne Hopkirk tried to work in the Office whilst subject to power cuts. Meanwhile, Andy Hopkirk was discussing drone imagery and mapping with a new visitor, whilst Mark Hatton also introduced our Eden District Councillor, Lissie Sharp,to the site.